The story of Ibiza’s rise to global popularity doesn’t start and end on its dancefloors. True, the White Isle entered a new lease of life when clubs like Amnesia, Pacha and Privilege spearheaded the dance scene of the late Eighties and Nineties. But away from the all-nighters and the bustling main strip, there’s an air of serenity permeating Ibiza’s coastal towns. In old Ibiza Town, the island’s national parks and its UNESCO Heritage Sites, there are beautiful landmarks which seem a world away from the heady heights of clubs in San Antonio and elsewhere. Beautiful beaches hug Ibizan coastlines fringed by crystal-clear waters, and nature reigns in remote pine forests northeast of Sant Carles de Peralta. Ibiza may be a clubber’s paradise, but it isn’t to be counted out if you’re in search of some peace and quiet too. Here’s our guide to the best Ibiza has to offer. Established by the Phoenicians as a trade port around 650BC, the island of Ibiza was apparently named in honour of the Egyptian god Bes, who among other things was associated with dance and music. Coincidence? We think not. For more architecture and historical significance than you can shake a maraca at, head to Dalt Vila, the Old Town. At the top of its steep slopes you’ll find what remains of the city walls built to protect residents against attack from pirates during the 16th century, as well as a castle and monastery. The Archaeological Museum is well worth a visit. Inside you’ll find artefacts discovered on the island that were left over from its occupations by the Phoenicians, Romans and more. Along with the tombs of Phoenician and Carthaginian origin found in the Ibizan villiage of San Josep, plus the island’s necropolis of Puig des Molins, Dalt Vila was added to UNESCO’s list of World Heritage Sites in 1999. Ibiza entered a new phase of history during the 1960s. As the island recovered from the tolls of civil war on mainland Spain, a new breed of enlightened traveller made its way to Ibiza. The population grew steadily with this influx of new and diverse interests, and some of the island’s most famous nightclubs opened for the first time, including Amnesia. The mix of idyllic surroundings and lively music scene would see Ibiza explode in popularity through the 1970s and 1980s, as tourists from the UK and mainland Europe arrived on the scene to see what its new musical movements had to offer. The rest, as they say, is history. For those in search of the legendary nightlife the island is famous for, most trips to Ibiza don’t extend far beyond San Antonio. This former fishing village is the primary port of call for clubbers, as the famous Sunset Strip beckons. But if you’re here for the early mornings rather than the late nights, Ibiza Town’s fascinating landmarks are just 20 minutes’ drive away. There’s plenty of bargains and some fabulous fashion to be found if you fancy shopping in Ibiza. Figuertas is a short drive from Ibiza Town, and packs its promenades with stalls selling arts and crafts during the evening – a great place for a browse and to take a cooling walk after a long day under the sun. San Antonio also has a number of department stores selling island fashions, accessories and souvenirs. We recommend cooling off at Aguamar water park, in the resort of Playa d'en Bossa, where you’ll find pools for all ages and abilities, and a collection of exciting water slides to conquer. There’s also a poolside cafe for grabbing some refreshments – you’re also welcome to bring your own packed lunch. If the island’s best water park whets your appetite for more undersea adventure, the scuba diving in Ibiza is also top notch. There are guided dives with all the proper equipment available at most Ibiza resorts, catering for a range of ability levels whether you’re a seasoned scuba diver or a first-timer. If you’d rather stick to sights above the surface, there are a number of boat trips in and around Ibiza. Formentera is the smallest of the Balearics, and best known for its sand dunes and beautiful waters. Day trips to Formentera are a great way to see some amazing beaches and enjoy the rush of the wind from on the deck. Es Vedra is an entrancing rock formation a couple of kilometres off the West coast of Ibiza, supposedly a black hole for navigation due to its magnetic field – and the home of the Sirens in Homer’s Odyssey. 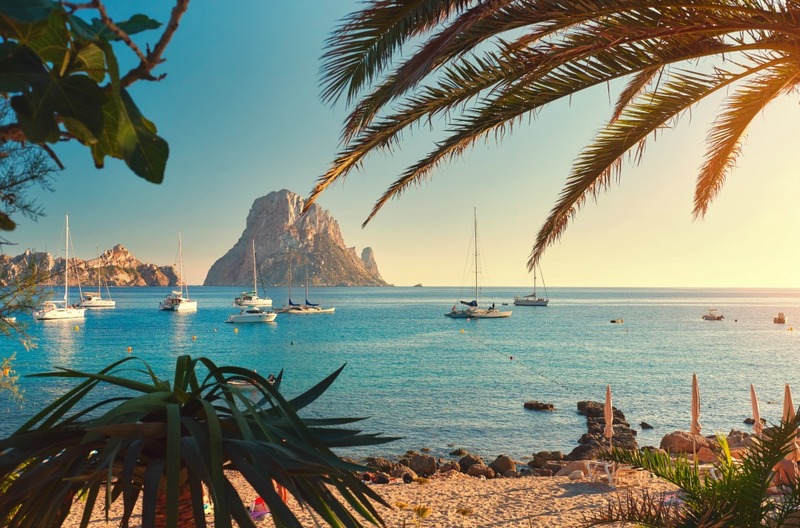 Whether you’re interested in being as close to the crowd as possible or getting away from it all, Ibiza has hotels to suit all budgets and plans. Here are some of our favourites. Situated in Santa Eulària des Riu, Can Pardal is close to the historic Puig de Missa church which overlooks the quiet coastal town. This restored 16th century traditional Ibizan house features a courtyard with jaw-dropping views of the hills, and a pool in which to take a relaxing dip. Winner of two European awards for interior design, this Art Deco delight will ease you into a relaxed holiday mood from the moment you step inside. Featuring a rooftop terrace with views of Formentera, and close to the old town, it’s an ideal location no matter what your travel itinerary. Situated in the quiet countryside, this rural retreat boasts tennis courts, pools and a welcoming family atmosphere laid on by the owners. Enjoy a stimulating yoga class, an intimate dinner with a view and a selection of countryside walks. Best of all, it’s still close enough on this small island if you fancy taking the tempo up a notch at a club later on. A clever combination of local delicacies and fuelling up on fast food gives you plenty of choice at dinner time. If you’re in Ibiza Town, end your day’s sightseeing with the catch of the day on the rocks at Talamanca Beach. There’s no set menu, but you’ll typically find The Fish Shack serving up a selection of sea bream, swordfish and sea bass – freshly caught and grilled to perfection. The sardines and prawns starter is also worth sampling. Michelin-starred Mar a Vila is said to serve the best tapas in Ibiza. Put them to the test with the highly-recommended red pepper/goat’s cheese combo, before making your way to the mains with a choice of risotto, ribs and more. For an added treat, the courtyard setting is superb. San Juan retains its hippie cool and calm at the top of the island, and Giri Cafe is no exception. Found on the village’s main square, cap off a quiet day’s exploring with something from this diverse menu – we loved the Iberico pork served with pumpkin. 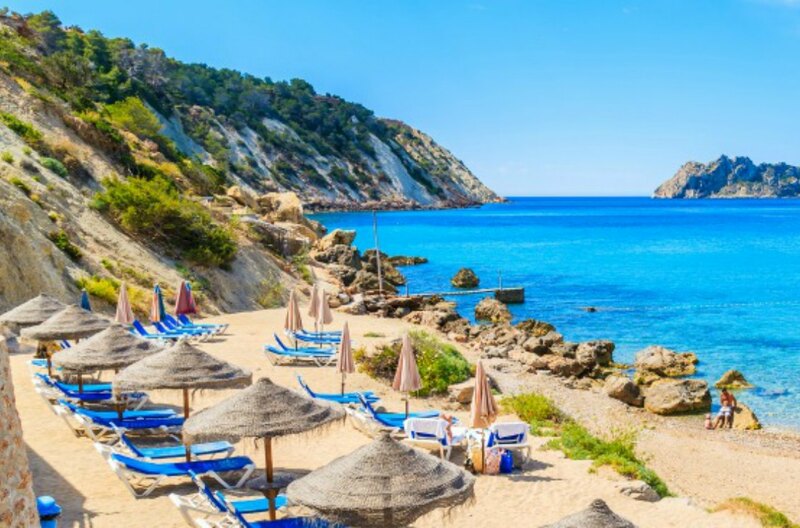 Despite only having 130 miles of coastline – the M25 is nearly as long – Ibiza is famous for its scenic sea views and stretches of golden sand. On the southwest edge of the island, Cala d’Hort is a little beach retreat offering magnificent views of Es Vedra, while Cala Llonga in the east is set alongside shallow waters, which means it’s a great place for kids to paddle as you soak up the views. If you’re set for a drive around the island, you’ll love the scenic journey towards Cala Vadella, which weaves its way through the pine forest towards a little slice of sea and sand to call your own. The previously-mentioned Talamanca Beach is only 15 minutes’ walk from Ibiza Town, and has one of Ibiza’s best restaurants in the Fish Shack. As it’s the culmination of a long day’s sightseeing for many of its visitors, you’ll find an assuredly relaxed vibe to go along with the great food. While these represent the quieter places to seek out the sun, Ibiza isn’t afraid to take the party down to the beach both before and after the clubs get into full swing. 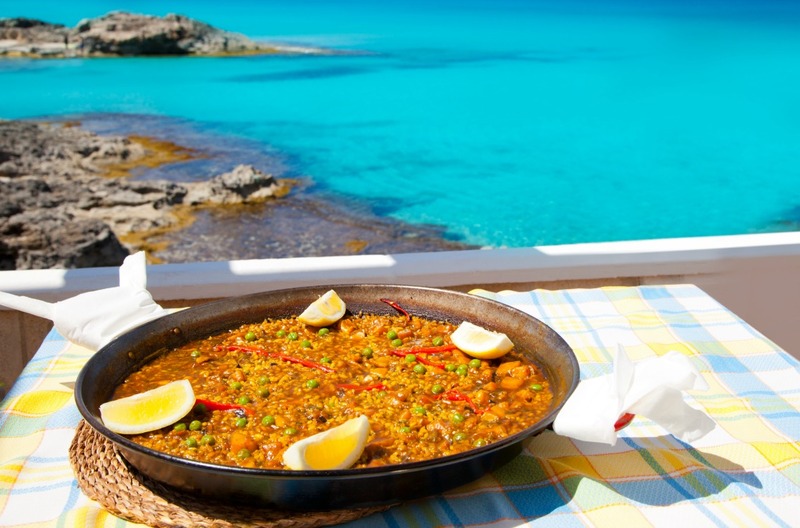 Las Salinas should be the first port of call for anyone looking to take it up a notch, with buzzing beachside bars and the big tunes Ibiza is world-famous for. And around sunset at Cala Benniras you’ll find the party warming up even further with drum circles and a sense of tribal togetherness that makes for the perfect transition to the clubs. With the changing landscapes and altitudes found throughout the island, Ibiza is the perfect place to explore, with forests and hills giving way to inspiring landmarks and idyllic secluded beaches. Es Portitxol is one such hidden gem, tucked away on the north side of the island. To reach it, take a car to Isla Blanca, a small settlement that’s some way northwest of the main roads around Sant Miquel. From here, make your way down the dirt trail that spans the north coast and you’ll soon see the glint of its beautiful waters. An even tougher trail awaits if you’re keen to see the sights at Ses Balandres – it includes a rope-assisted descent and some clever use of ladders. But if you’re up to the task, the reward is unrivalled views of the west-facing waves from a small and secluded beach. Majestic. As with many of Europe’s most popular holiday destinations, choosing where to stay in Ibiza depends on the kind of holiday you most want to have. But luckily, because of its relatively small size and transient moods, you don’t have to miss out on the odd moment of tranquillity if you choose one of its busier places to set up camp. Away from the serenity of Dalt Vila, it’s in Ibiza Town where the big nightclubs call home. And on the Marina Botafoch, there’s a wide variety of bars and restaurants to suit each and every mood. Accommodation is equally varied too, with a selection of four- and five-star boutique hotels alongside the budget options. San Antonio is another popular resort known for its nightlife, but it’s a good spot for shoppers too, and boasts some of the island’s very best eateries. Playa d'en Bossa is where you’ll find the longest stretch of sun and surf, with golden sands stretching across the whole resort. Travelling the length and breadth of the whole island is definitely encouraged to experience everything Ibiza has to offer. The roads are in great condition so it’s easy enough to get around if you decide to hire a car in Ibiza. Don’t limit yourself to the busy resorts either – there’s so much to see and do outside of the town centres that you’ll be glad of the chance to do some exploring.